The essential introduction for those new to SUP , the half day session is lead by one of our qualified instructors, providing you with the foundations, knowledge and technical skills to get you Stand up Paddle boarding. The perfect introduction for those new to SUP followed by SUP safari River Tour down the Lake District's beautiful river Derwent. Children under 16 must be accompanied by an adult. Session not suitable for children under 11. SUP FEST 2019 31st May -3rd June 2019 3 nights camping paddle boarding and fun. A fun group intro to SUP, lead by one of our qualified instructors, providing your group with the foundations, knowledge and technical skills to get out Stand up Paddle boarding. Use of the Monster SUP can also included in the session. A fun group intro to SUP, lead by our qualified instructors, providing your group with the foundations, knowledge and technical skills to get out Stand up Paddle boarding. Use of the Monster SUP can also included in the session. The essential introduction for those new to SUP , the half day session is lead by our BC qualified instructors, providing you with the foundations, knowledge and technical skills to get you Stand up Paddle boarding. The Mega SUP adventure is the ideal SUP experience for a mixed age family group or group of friends of 4 - 6 People. The session last 3 hrs and includes the Mega SUP and instructor/guide to help you get the most out of your adventure. 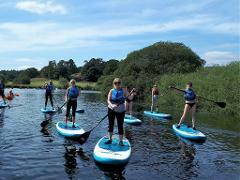 The Private SUP session is the perfect SUP experience for a mixed age family group or group of friends of up to 6. The session last 3 hrs and includes all equipment and instructor/guide.